The recent demise of mylasagnarecipe.com has prompted me to come out of hibernation and post my transcript of their recipe here. Caveat emptor: it is not an entirely faithful rendering. And I’ve never followed this recipe exactly as written. I’ve subbed mushed firm tofu for ricotta and Yves’ tofu ground beef for the meat, and really, it was almost as good (as long as you eat it hot, coldish tofu lasagne tastes like — tofu). The flavor of the Italian sausage varies from brand to brand. You may need to try a different brand the first couple of times you cook this dish. Find the flavor you like the best. 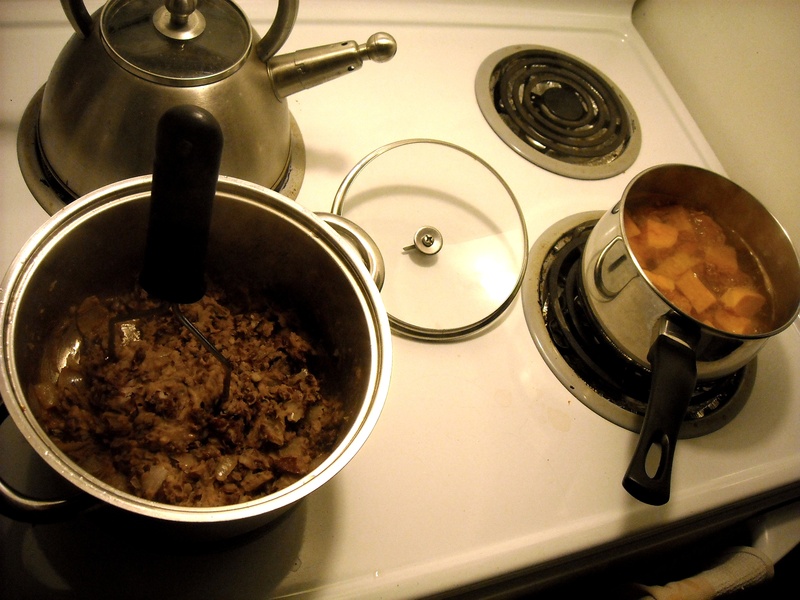 Brown the ground beef, Italian sausage, onions and garlic in a pot until they start to cook. It takes about 6 to 9 minutes to brown the meat. I like to use a Dutch oven to cook this portion of the recipe. I use a medium low temperature to brown the meat. It is optional to remove the grease from the meat once it is finished browning, your choice. Gently stir this into the cooking meat. Gently stir these seasoning into the sauce. Cover the pot and let the meat sauce simmer. Simmer on low heat for 1 hour and 30 minutes. This is the ideal simmer time but not mandatory. If you don’t have time it will still be great after one hour of simmering. I will sometimes make this sauce and refrigerate it after it finishes simmering. I will use the meat sauce the next day to put the rest of this recipe together. For some reason Italian meat sauce taste even better the next day. But that’s up to you. Soak 12 lasagna noodles. The lasagna noodles need to be soaked in hot tap water for 15 minutes. 23 ounces (644 g) of ricotta cheese. Mix these ingredients together with a spoon. Now we start building the lasagna layers. Use a 9×13 inch baking pan. Spread 2 Cups (480 mL) of meat sauce on the bottom of the pan. Remove your lasagna noodles out of the water bath. Shake water off wet noodles. Lay 6 noodles across the layer of sauce. Spread half of the ricotta cheese mixture over the layer of noodles. Spread 1/2 of the mozzarella cheese over the ricotta layer. Remove foil and bake uncovered for another 25 minutes. Remove from oven and allow to cool for approximately 15 minutes. 1. 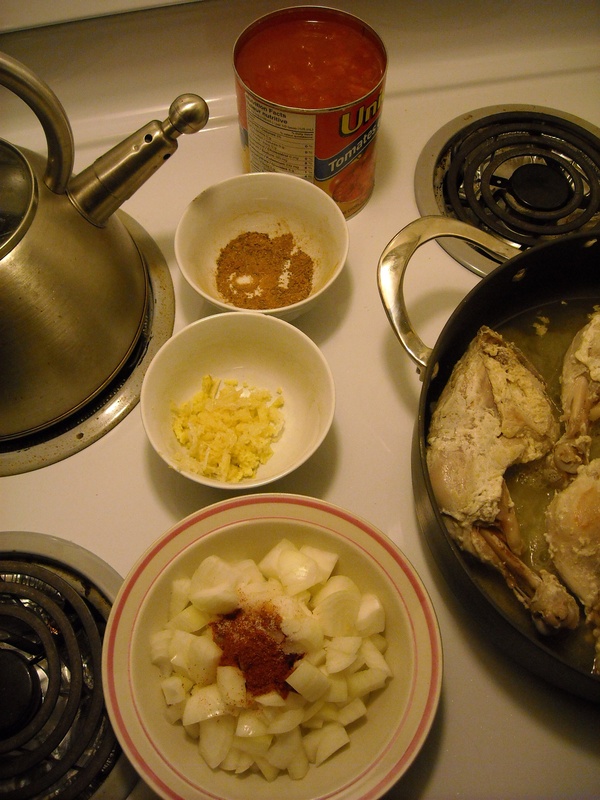 Fine-chop garlic, onions, and ginger, then mix together and crush with a mortal and pestle. 2. In a large frying pan, heat 2 Tbsp of vegetable oil. 3. Add the garlic-onion-ginger mix, garlic chili sauce, and coconut milk. Stir. 4. Add the lime leaves, bay leaves, and lemongrass. 6. Cover and cook on medium heat for 20 minutes or so (until chick is cooked through, and all the Sam ‘n’ Ella are dead). Serve on jasmine rice and top with chopped shallots. Note the original recipe called for aniseed and galangal, but I didn’t use either. Still tasted quite good to me. Unfortunately, I don’t have a lot of time for ranting at the moment. Instead, here’s a rough approximation of a recipe from my ex-wife, always popular with guests. PROTIP: To save time, cook your kidney beans while you boil the sweet potatoes! Cut it into chunks (for faster cooking). Boil in salted water until soft in the middle (stick ’em with a fork). Remove from heat, drain water, and mash. Peel the onion and chop it coarsely. Drain and rinse kidney beans. In a heavy-bottomed pan, heat the oil on medium heat. Add beans, soy sauce, cumin, and cayenne to the onions. Cook for about 15 minutes, stirring to prevent sticking on the bottom of the pan. 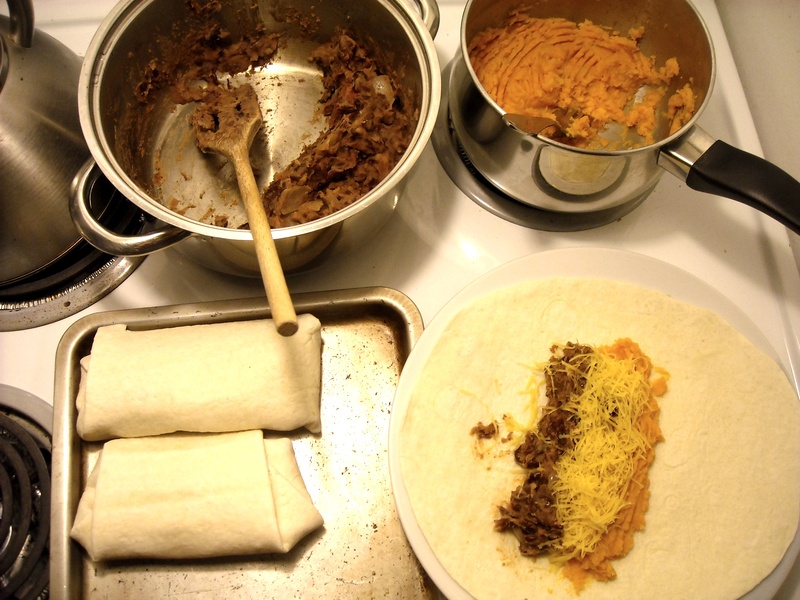 Sprinkle cheese over the bean and sweet potato. Serve with salsa. I use Safeway Select Chipotle Salsa Medium. Or if I’m feeling ambitious, I’ll make a nice mango salsa. I may not be around much next little while. I still have lots to blather on about, but a couple real-life concerns are demanding my attention. Before I go, here’s a recipe. There’s a curry recipe I like to follow, but I’m not a fan of how it’s written; the garam masala is in a separate recipe, which makes sense and I appreciate the modularity, but I don’t currently make any other dishes requiring it, so for me, I’d be happier having it in a single post. Also, for someone like me, this is a complicated recipe, as it requires preparing a marinade, marinating overnight (for best results), and a few steps once it gets to the stove top. Still, I’m happy to make the investment of time and energy because the results have so far been really good, i.e., really tasty. To make things a bit easier for myself, I’ve taken to prepping ingredient bowls for each stage of the cooking (see picture). And since I’ve taken that picture, I find it really helps me to remember both the ingredients and the steps, and I no longer need to refer to the written recipe as much. Mix yoghurt, ginger, oil, and lemon juice. In a large frying pan, heat your ghee, oil, or margarine. 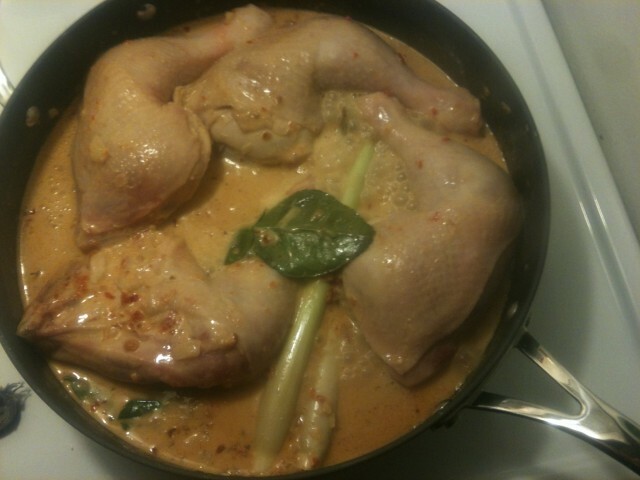 Remove chicken from marinade and place in the pan. Remove chicken and put aside. Empty bowl 1 into the pan. Cook until onions are soft (5 minutes). Empty bowl 2 into the pan. Cook for 2 minutes. Empty bowl 3 into the pan. Cook for 1 minute. Empty bowl 4 into the pan. Cook for 5 minutes. Serve with basmati rice (white or brown) and naan bread. It’s not vegan. It doesn’t pretend to be a beef burger. It just tastes good and it’s easy to make. In a large mixing bowl, add rice, crushed walnuts, and eggs. Mix thoroughly. Add garlic, onions, mushrooms, salt, pepper, and sesame oil. Mix thoroughly. In a heavy bottom skillet, put a couple tablespoons of canola oil (or some other high-burning point vegetable oil), enough to coat the bottom. When the edges of the patties begin to brown, flip them over. When both sides are cooked, remove from heat. You can serve on a bun with burger condiments or with rice. I like it crumbled into bits served with Sambel Cap Jempol Chilli Sauce. Unicorns Will Not Save You. But Spacesteading Might.